– To eliminate sticky client behavior while users roam, 200 series APs feature patented ClientMatch technology, which continuously gathers session performance metrics from mobile devices. – If a mobile device moves away from an AP or if RF interference impedes performance, ClientMatch automatically steers the device to a better AP. – ACC lets WLANs perform at peak efficiency by minimizing interference from 3G/4G LTE networks, distributed antenna systems and commercial small cell/femtocell equipment. – The 200 series APs support priority handling and policy enforcement for unified communication apps, including Microsoft Lync with encrypted videoconferencing, voice, chat and desktop sharing. •Controller-managed AP or Remote AP (RAP) running ArubaOS. When managed by Aruba Mobility Controllers, 200 series APs offer centralized configuration, data encryption, policy enforcement and network services, as well as distributed and centralized traffic forwarding. 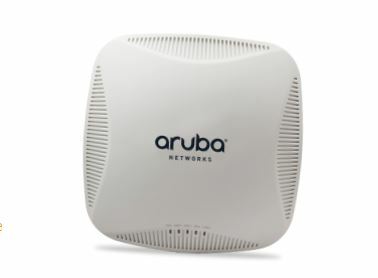 Please refer to the Aruba Mobility Controller data sheets for more details. 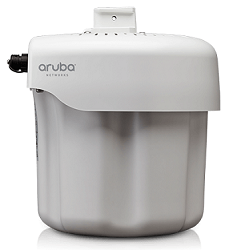 •Aruba Instant AP running InstantOS. 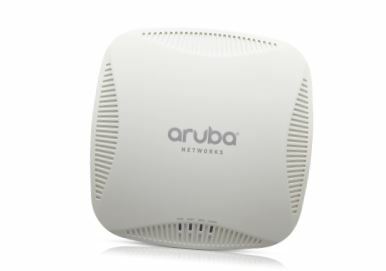 In Aruba Instant mode, a single AP automatically distributes the network configuration to other Instant APs in the WLAN. Simply power-up on Instant AP, configure it over the air, and plug in the other APs – the entire process takes about five minutes. If WLAN requirements change, a built-in migration path allows 200 series Instant APs to become part of a WLAN that is managed by a Mobility Controller. – 2.4-GHz (300 Mbps max rate) and 5-GHz (867 Mbps max rate) radios, each with 2×2 MIMO and four integrated omni-directional downtilt antennas. – 2.4-GHz (300 Mbps max rate) and 5-GHz (867 Mbps max rate) radios, each with 2×2 MIMO and two combined, diplexed external RP-SMA antenna connectors. – Adaptive Radio Management (ARM) technology automatically assigns channel and power settings, provides airtime fairness and ensures that APs stay clear of all sources of RF interference to deliver reliable, high-performance WLANs. – The 200 Series APs can be configured to provide part-time or dedicated air monitoring for spectrum analysis and wireless intrusion protection, VPN tunnels to extend remote locations to corporate resources, and wireless mesh connections where Ethernet drops are not available. – Capable of part-time or dedicated air monitoring, the spectrum analyzer remotely scans the 2.4-GHz and 5-GHz radio bands to identify sources of RF interference. – With an OpenDNS service subscription, Aruba Instant RAPs deliver integrated web filtering, malware and botnet protection to every device connected to the WLAN. – SecureJack-capable for secure tunneling of wired Ethernet traffic. •AP-204/IAP-204: Two RP-SMA connectors for external dual band antennas. Internal loss between radio interface and external antenna connectors (due to diplexing circuitry): 1.5 dB in 2.4 GHz and 3.0 dB in 5 GHz. •AP-205/IAP-205: Four integrated downtilt omni-directional antennas for 2×2 MIMO with maximum antenna gain of 4.0 dBi in 2.4 GHz and 6.0 dBi in 5 GHz. Built-in antennas are optimized for horizontal ceiling mounted orientation of the AP. The downtilt angle for maximum gain is approximately 30 degrees.